Initially, several coffee shops and restaurants operated in Sosúa: Café Stockmann and the Bakery of Franz Heiss were among the most popular. 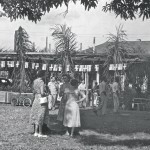 It was in one of these locations – also the site of Sosúa’s only European bakery – that the future Café Oasis was established. 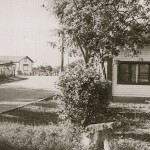 This large house was centrally located on Sosúa’s main street and had an ample backyard where settlers could sit in the shade and relax. Originally, Café Oasis and the Hotel Garden City – the only hotel in Sosúa and its surroundings – were under the same administration. During its early years it was managed by the DORSA, but as time passed it was converted into a cooperative. The menu offered a variety of dishes, some similar to most dishes offered in Dominican restaurants of the time, some more in the European tradition, such as Dobosh torte, Wiener schnitzel, and goulash soup. In the early years the Café Oasis was the place where most of the settlers gathered daily for an afternoon cup of coffee or tea and dessert. 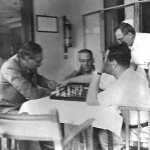 They played cards, chess, and other games while they gossiped about what was happening in the world. Eventually, a bowling alley was also installed at the side of the building; the kegels (pins) and balls were manufactured by a settler. 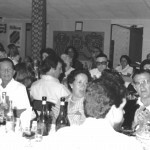 Importantly, the Café Oasis had a large enclosed dining space and was therefore used for many big town gatherings, such as Passover dinner, Sosúa reunions, and parties on New Year’s Eve. In the 1960s the business was sold to a Dominican couple, Carmen and her husband Ernesto Matos. 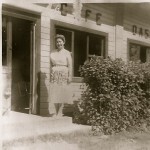 Carmen was the original chef at the Café Oasis, and had learned her European repertoire from some of the original female settlers. In the years that followed, Carmen and Ernesto removed the bowling alley to make room for additional seating. 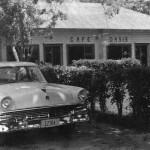 Popular Dominican performers such as Johnny Ventura, Wilfrido Vargas, and others played at Café Oasis with their bands and combos. During this period Café Oasis attracted a much wider audience, bringing native Dominicans from Puerto Plata and even Santiago. The Sosúa settlers stopped going to the Café Oasis for afternoon coffee and games; they continued to use the facility as a restaurant, for Passover seders, and for Sosúa anniversary reunions.